Late Chandravatiben Chhotalal Devshi Malde | Oshwal Association of the U.K. 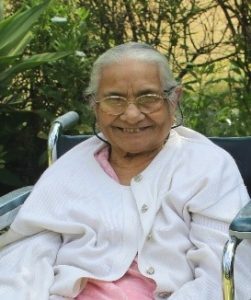 It is with deep regret we announce the death of Mrs Chandravatiben Chhotalal Devshi Malde on day, 03rd August 2018 in Nairobi, Kenya. She was Daughter of Late Nemchand Virchand Shah & Late Amritben Nemchand Shah. She was Daughter-in-law of Late Devshi Nathoo Malde & Late Diwaliben Devshi Malde. She was Mother of Kirankumar (UK), Late Daksha, Late Bindu, Nilam (Chaandu -UK), Rajesh & Sanjay (Nairobi). She was Mother-in-law of Bharti (UK), Kishore, Chandu, Ramesh (UK), Dipti & Mayuri. She was Aunt of Bina & Late Pravin, Atul & Darshni (UK), Manoj (UK), Alka & Chetan, Atish & Priya, Smita & Dipan (UK) and Shreya & Dhiren (UK). She was Grandmother of Hema & Niraj, Prashant (Papu) & Bhavni, Mehul & Sejal, Neel (Niku) & Anjli, Mitul & Sonal, Rahul & Poonam, Nishal & Gauri, Dipesh & Payal, Jaanki, Vishal, Ronak, Nikita & Deepali. She was Great Grandmother to Dhilan, Aryan, Khush, Kayla, Udai, Saman & Mahin. Prayer meeting will be held on Saturday, 18th August 2018, 8-10pm, at Zaverchand Virpar Memorial Hall (Z V Hall), above Motor Parts direct, Kingsbury Works Estate, Kingsbury Road, Kingsbury, London NW9 8UP.